The Slotcar Outhouse • View topic - SCX Seat 1430 "Zanini"
Slot car racing is a bit of a strange hobby really. 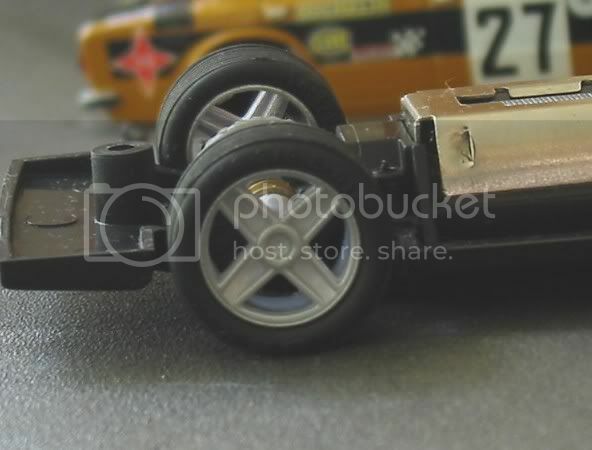 Lots of people own slot cars and sets but only a small number actually get to put them to their intended use! That is to get out there and race against someone else! One of the big problems I have encountered with other people is the fear of loosing. People would rather sit a race out than run the risk of coming last. Its a shame really and there is no real answer. With most commercial tracks running at a disparity or an expensive class system there are going to be the vast majority of prospective racers confined to the privacy of their own home track.......on their own! Funny way to start a topic on SCX ??? Well, not really!! SCX are virtually one of the only manufacturers who cater for parity in racing. Whilst a lot of manufacturers make models that are as different as chalk and cheese, even in common classes, SCX have been making models which, for the most part, class by class, are pretty well equal. All their F1’s are on a par with each other, Their DTM’s all have the same turn of speed. The WTCC cars too are a good match and so it goes on. If racing organisations and commercial outlets had less expensive and more matched classes like SCX, then maybe the greater majority of racers would feel more inclined to join in. I can hear the prima donnas pooh hooing the idea already!! But then they are only prima donnas! Well SCX DO make comparable models and they do make good fun racing. I have and do race all types of models successfully in club and commercial situations. On board and plastic. Fly and Slot it, Scaley and Ninco, and I get great joy from ALL types of racing, from NC1’s to Slot. its and I have to say I enjoy a close run SCX class as much as any of the SCM’s preferred racing. Purely and simply because the models are matched and driver ability is the deciding factor. SCX allow this in the way they make their models and many an SCM has shunned this class because they don’t have the driver ability!! 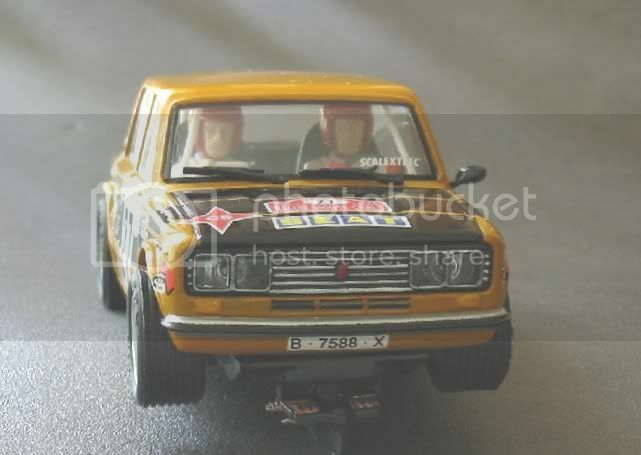 The SCX Seat 1430 is a hard to find beggar for anyone living outside of Spain. This is one of their ‘in house’ models for local consumption only. But as with all things, the great white eBay throws them up from time to time, and as time passes they become more reasonable. This one was purchased from eBay Australia (my local) for what I consider to be good value compared to Spanish sources. The model turned up quickly at my doorstep and because of commitments, slotcar and otherwise, it was a couple of days before I could inspect it at leisure. The model looked a little ‘naff’ on the listing but on opening the box this apprehension was immediately dispelled. The model is as good as any and its scale and finish are excellent. The Seat 1430 looks to be the Spanish version of the Fiat 124 which was a rally tool in the seventies. Hard to believe that a sedate car could be pushed to the edge in the name of competition. But luckily for us it was and it is now immortalised in plastic for all those with an eye for it. The model is based on the No. 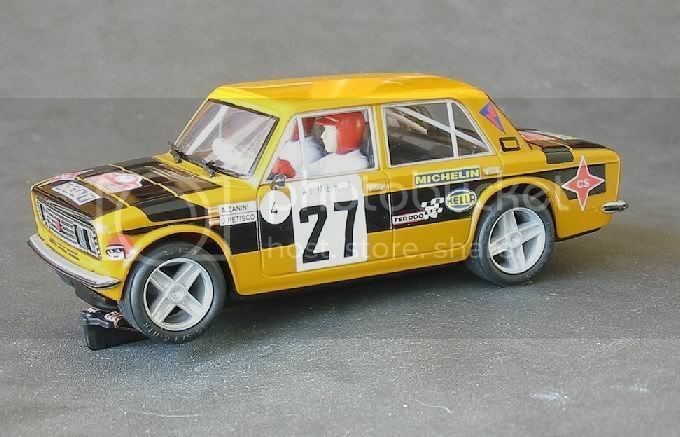 27 car as driven by Antonio Zanini in the 1976 Monte Carlo Rally. It’s finished in a rather fetching mustard yellow with black panels and SCX have done their usual good job of tampo ing the sponsors’ details on the body. The car has a front and rear bumper both of which look fairly safe but time will tell. There is one door mirror sticking into the roll over zone so this may need to be removed and stored safely before battle commences. No antenna or other protuberances so this is a low casualty model with everything screwed down firmly. Front grille and light detail are good and the front twin lamps actually have a single clear LED behind each and the rears to are bright. The dull colour of the model and some judicious screening inside the model ensures there is no light bleed through the plastic body. There is only a half driver’s tray inside but this does come with a full roll cage. 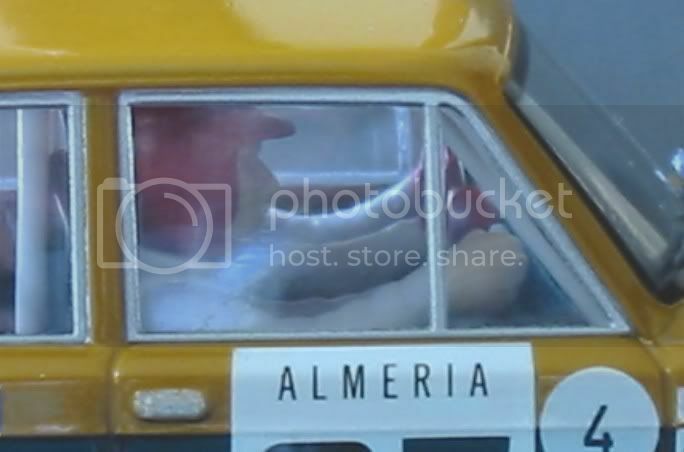 Dash detail is also minimal and there is a vestigial gear lever situated between the ‘Smothers brothers’ inside. Underneath, SCX are going to great lengths to display chassis detail, probably for those who spend a greater amount of time with their wheels in the air no doubt! But apart from that the RX 41 motor is clear and the magnet too is readily accessible as always. 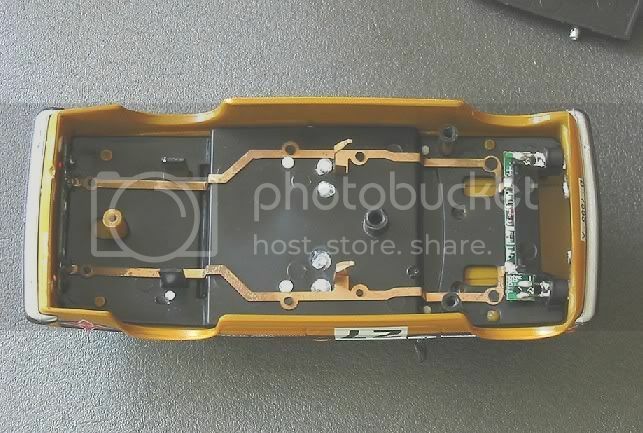 This magnet varies from previous in that the holder doesn’t have the little cut outs in it to allow it to be removed and installed with the screws in place? No worries. I usually stick the assembly to a modellers knife blade anyway to facilitate easy refitting. A couple of things capture my attention now. Firstly, the front axle seems noisy when spun, this is a 2WD model and the front end has more side slop than I would like and it’s noisy too?? Also, when the self centring guide is moved side to side, there is a definite spring stretching sound?? Mmmmmmmmm............? Lastly there are some definitive ‘70’s wheels all round and to finish off, the model has the stock SCX type 2 tyres all round. These will be changed for the type 7 rally slicks which are far superior for most surfaces. The screwdriver is out and all is about to be revealed! Only three screws to be removed. Two front and one back, almost my ideal set up. On removing the body all is very simple, very tidy. The light system has been neatly tucked up in the body. The circuitry is very compact and effective too. The conductor rails are fixed to the drivers tray and there are no messy wires hanging about. Whilst it was apart I tapped the body and there doesn’t appear to be any loose or rattly heat welds. A drop of PVA on each wouldn’t go astray though. 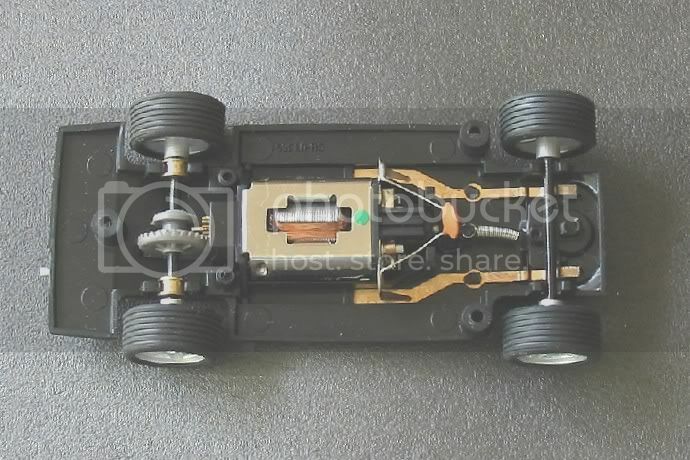 The chassis layout too is reminiscent of earlier 2WD models. The only difference being that the self centring guide is operated by a coil spring rearward of the unit. I suspect lack of space has ruled out the current SCX hairspring set up? 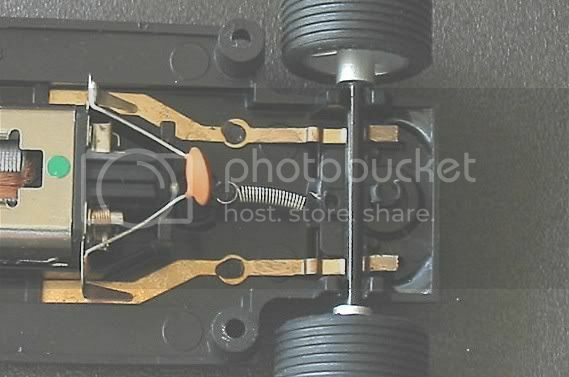 The rear axle runs in brass bushes and the axle is quite snug in these but the front axle clips into the chassis material and it is this which acts as a sounding board and amplifies the spinning axle. Maybe a drop of Vaseline will quieten it up, or maybe a short piece of piano wire pretensioned against the axle might do it. All the wheels are as true as you’d want but the type two tyres haven’t changed much over the years and although they look to be newer mouldings, they will still need a bit of judicious sanding if they are to be kept! Lastly this looks to be a great little racer. It has all the tried and tested features of previous SCX models and a test run would be a formality. When setting up this type of model it it will be just a case of removing the slack from bushes. 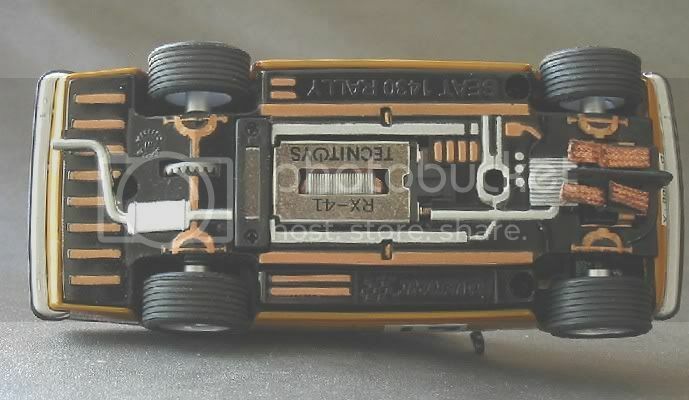 Ensuring the body can move freely a little on its screws and that tyres are round. The only other mod I would make would be to fit some tinned braids as I find them less trouble as they age. SCX guide shoes have a tendency to run nose down. One way of minimising this is to cut off the little pimple at the FRONT of the guide. This encourages the guide to start off in the nose up position. 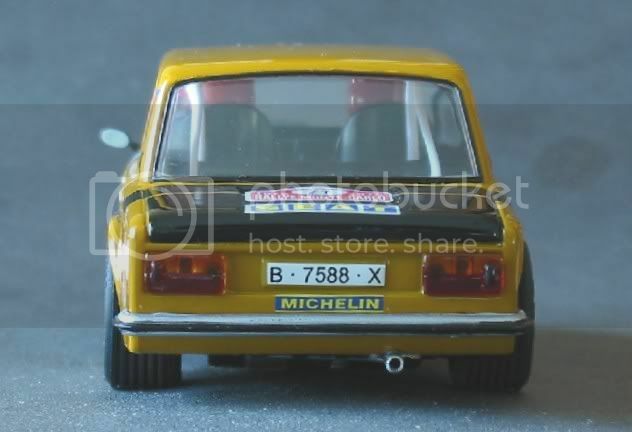 Lastly, as with other examples of these ’cute’ little cars, their size belies ther ability and these little beggars will hop round the average plastic track in respectable time. Their adjustable magnets will hang on for dear life. The best way to set them up is to screw out the traction magnet ‘til it is just clear of the conductor rails then screw back in a quarter of a turn at a time watching your lap times all the while. There will come a point where the model will be lapping fastest while staying on. Another quarter of a turn should see the model deslot on flat out bends. Reset the screws back a quarter and the model should be at its optimum! I look forward to giving this model a good run but it will be unlikely to be competition simply because it has taken so long to get this one! So it will be pulled out for a few leisurely (and not so leisurely) laps from time to time. If you get the opportunity to lay your hands on one of these for a fair price and your not an SCM then do so. If I find a second one then things get serious on the track! !